The TRC on Indian Residential Schools welcomed our proposal in 2011 and the Ministry of Aboriginal Affairs Canada financed it with a generous grant. 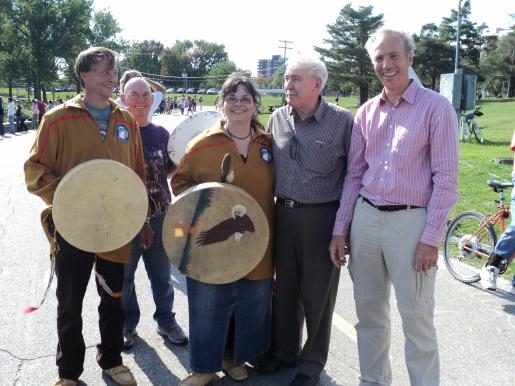 Three full-day public Forums were held in Victoriaville, on March 17, 2012; in Montreal on August 4, 2012 during the annual First Peoples’ Festival; and in Quebec City on March 2, 2013. The aim of the project was to engage Aboriginals and non-Aboriginals in a common and inclusive approach through a process to generate real opportunities for encounters in a number of events with a generosity of spirit and an open heart. Dominique Rankin, a survivor of the Residential Schools and now a messenger of the healing process and also an Algonquin hereditary Grand Chief, accepted the role of spiritual leadership for the main events of the project. Furthermore, Espace Art Nature took on major responsibilities, and a good number of peace groups, organizations and dynamic volunteers got involved in the venture. At the financial level, in addition to the federal ministry of Aboriginal Affairs, other main donors gave support such as : the Secrétariat aux affaires autochtones du Québec, the City of Montreal, the Fondation Saison Nouvelle, the Brian Bronfman and family Foundation, the Mennonite Central Committee. Thanks to them and to individual donors, this project was made possible. Although the Citizens Project with its three main forums marked the end of its first phase in March, 2013, Permanent Circles of Trust continue in the cities mentioned above to help create opportunities for an ongoing way of meeting, listening and dialoguing, as an act of citizenship between First Nations, French and English Canadians and more recent immigrants. The Voice of Silence, the one-hour theatrical presentation produced by Espace Art Nature for the Forums, will tour First Nations communities, schools and other institutions in Quebec province, between now and March 2014. The heart of the presentation is expressing testimonies of the survivors of the Indian Residential Schools. For further information contact Laurent Gagnon. Quebec City team welcomes Council member from MontrealQuebec City, March 11, 12—Fulfilling a long-held wish of Lucie Pagé, Regional Coordinator in Quebec City and of Elizabeth Slanke a Montreal-based member of IofC’s Council of Management, three members of the Montreal team travelled to Quebec City to participate in the meeting thereon March 11. They were Elizabeth, her husband Ron Meetoos, a member of the Cree Nation of Saskatchewan and an active member of the Circles of Trust in Montreal as well as of the Voices of Silence presentation, and Laurent Gagnon. The Quebec team continues its work of trustbuilding in the province, creating harmony among its diverse people. The first video gives an overview of the Citizens Project/Circles of Trust, in Quebec. The second video provides a peek into the Trustbulding workshops that take place in Alberta.